Longtime neighborhood activist Byron Sigcho-Lopez rode to victory Tuesday against nurse Alex Acevedo in the race to become the next alderman of the 25th Ward, setting an uncertain future for a rapidly-growing part of the city that includes the 62-acre footprint for Related Midwest’s planned The 78 mega-project. With all of the ward’s precincts reporting, Sigcho-Lopez had a nearly 10-point lead in the runoff race. The new alderman will take over for retiring Alderman Danny Solis (25th), who disappeared from the City Council this year after being implicated in a corruption scandal. Both candidates seized on the alderman’s cozy relationship with prominent city developers and have vowed to give neighbors more sway in the city approval process for new construction. The ward includes most of the Pilsen neighborhood, in addition to parts of the West Loop, South Loop and Chinatown. Sigcho-Lopez emerged in first place among a field of five candidates in the Feb. 26 election, winning 29 percent of the vote. Acevedo, son of former state Rep. Edward Acevedo, finished in second place with 22 percent, securing a spot in the runoff. Heading into the election, real estate donors mostly stayed away from the race, paving the way for Sigcho-Lopez’s union-backed campaign to dominate other candidates in fundraising. But after February, an array of builder groups and some developers sprang into the race with checks for Acevedo’s campaign. Leaders of JDL Development, Shore Property Management and Noah Properties all made contributions. Acevedo also won the support of the Chicago Association of Realtors, which announced it would donate to his campaign last month. And the Illinois Association of Realtors has paid for mailers and digital advertisements supporting him. Both candidates distanced themselves from Solis and promised to exact more scrutiny on developers. 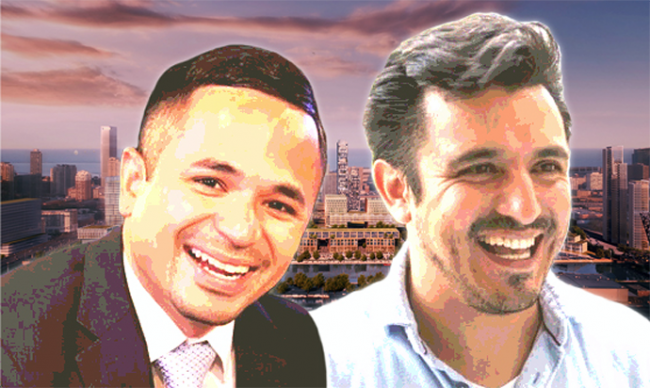 But Sigcho-Lopez, a member of the Democratic Socialists of America, said he would require any new development seeking a zoning change to set aside 30 percent of units as affordable, a figure Acevedo never matched. The next alderman will help decide the fate of Parkworks, a 465-unit mixed-use complex proposed by New York-based Property Markets Group for a prominent eight-acre lot in Pilsen. Solis re-zoned the property in 2016 to block the proposal, saying it didn’t include enough affordable units, and the developer sued the city in response. The lawsuit is ongoing.